Baruch Levine has long been known as a composer and performer, whose material is both sweet and enjoyable. Although he has some really beautiful songs on other people’s albums, his big break came on his first release, Vezakeini, with the songs Vezakeini and V’hu Keyli making everyone’s list of must listen to songs. Every time I pick up a new CD and see that he composed a song on the CD, I am confident that it will be a beautiful and enjoyable song. As a full disclosure, I had the opportunity to sing once with Baruch, at his brother’s wedding, and he is also a first rate mentch. Saying all this, Baruch has a very distinct style, and on his newest release, Hashkifah, it is very evident. For anyone who is not a fan of his, or is in the mood for change, this album will not be for you. For me, who loves Baruch’s music, this album really hits the spot for me. He mixes his hartzige and sweet songs, with lebedik and enjoyable, but not wild, songs. Yochi Briskman is once again Baruch’s producer, and the musical arrangements are by his son Yanky Briskman, and Baruch himself. I think that both the musical and vocal arrangements are done tastefully. Hashkifah – Ok, so it’s not such a surprise that Baruch picks his title track to be the first song on his album, until the music starts, and it’s a slow song! 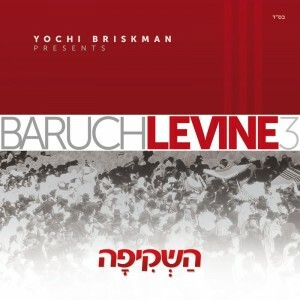 Usually an album starts off with a real bang, but Baruch Levine’s signature songs are all nice, slow and hartzige so it’s not a complete surprise to me that he begins this album with another sweet and hartzige song. Whether this or any of the songs on this album become hits, only time will tell, but this sounds like another special song. Tov Lachsos – This is the first lebedik song/Hora on the album. I like how the intro is very upbeat, and when Baruch sings the low part of the song the first time around, the drums, bass, and most of the other instruments are silent, to allow us to capture the sweetness of the song, in its most simple form. The high part is very catchy (and that’s really the first thing that caught my ear when I was listening to the sample promo clips). I also enjoyed the choir’s harmonies, especially by the bridge at 2:46 of the song, and the high part at 3:13.The key modulation (which I happen to love and seemingly is also a favorite of the Briskman Family with Yaakov Shwekey and Baruch Levine) at 2:30 only helps highlight Baruch’s tremendous range. B’ni – Before I give my opinion of the actual song, I would be remiss if I didn’t mention my disappointment that the song starts with a very cheap and synthesized keyboard sound, which in my opinion, is out of place on such a nice hartzige song. Being raised by a professionally trained pianist, there is nothing nicer to me than a talented pianist playing a piece, and the sound used does not do justice. Now, to my assessment of the song, I don’t want to sound repetitive, but Baruch composes really nice, sweet and melodious songs, and B’ni is no different. He is joined by child/bochur singing sensation Dovid Dachs (whose voice sounds like it is finally changing….lucky him, my voice was changing within months of my Bar Mitzvah). Tlas – This is Baruch’s 3rd regular album (as evidenced by the 3 after his name on the front cover) and has a song named Tlas (three in Aramaic). Hmm…. Ok now onto the song itself. I am not a big fan of using obscure lyrics, especially not from the Zohar (or based on a Zohar). Despite that, the concept of the song is very meaningful. The song is a Mediterranean styled Hora, and it is a nice song, and I like how Baruch ends the song. Bit’chu – While it is very hard for me to pick a favorite song on this album, if I had to, Bit’chu would be it. It is another beautiful hartzige song, with beautiful and meaningful English lyrics that just add to the song. This song is also the album debut for child soloist Dovid Ginsberg, son of my old friend Rabbi Doniel Ginsberg (from my CKT days). I have heard him live, and he is truly a talent. Once again, there is a key modulation (at 4:46) and my earlier comments can be inserted here as well. I will try to refrain from mentioning it again, but it is very prevalent on this album. V’hogisah – I get a rush of adrenaline listening to this song, and it makes me want to get up and dance the hora. Ok, maybe I’m exaggerating a little bit, but it is a very upbeat hora, that in my opinion has the best chance of being a hit song at weddings. I am particularly fond of the intro. Mo Ashiv – Not to beat a dead horse, but once again the synthesizer to begin the song is a bit disappointing, and the amazing guitar piece that follows really exposes it even more than before. Overall, however, I do like the arrangements on this song, and to my knowledge it is Baruch’s first time arranging. There are some really nice guitar solos on the song, a nice saxophone solo, and I also love the harmonies that Baruch sings with himself. Sheyibaneh – Here is the first and only freilich/rock song of the album. It is an enjoyable song to listen to. Rina – The intro of this song is very brass heavy, with trumpet blasts throughout the song, and what do you know, the song is about “Joyous song and salvation and triumphant trumpet blasts- when I went forth from Mitzrayim”(as copied off the cover). I personally think it’s cute and that it is a good “chop”. Dovid Ginsburg adds his vocals to this song (he actually is recorded as a boys choir) and does a real nice job. This song alternates between march and ballad styles so it doesn’t flow as well as I think it could, but I think it does alternate to reflect the mood of the song and the words of the song. Kol Atzmisai – For a while it was very popular to have songs with the approximate style on albums. It is not a slow balad, but it’s not fast like a freilich song, or rocked up like a hora (I have seen songs like this classified as an “Oom-Pah”, but I do not know if that is an actual musical term). Actually one of my favorite songs is in a similar (albeit a little slower) style and composed by Baruch on Aish 2, Orech Yamim. Incidentally, my 3 favorite songs from that album are all Baruch’s compositions: Birchas Habayis, Orech Yomim and Ma Tovu. This is the type of song that could be played during dinner music at a wedding and those who don’t like “moan and groan” songs (there are people out there who do not like listening to anything slow….) would be happy. This is a nice song, and is enjoyable to listen. Refuah – This is a song that was originally performed and recorded for Yaakov Shwekey’s concert Live In Caesaria II. It is a beautiful Baruch Levine song, and I think he really does it justice singing it by himself. This is another song that has a chance to become a classic. In conclusion, I think this is a wonderful album and very worth your while to purchase. You can purchase this album as a download or a CD available at Mostlymusic.com (http://www.mostlymusic.com/hashkifo.html) or wherever Jewish Music is sold!